A Baker’s cyst is a collection of fluid in the back of the knee that can cause pain and swelling. 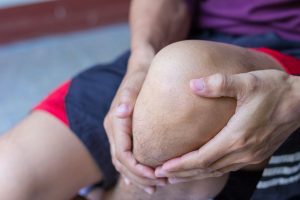 The cyst is often associated with an underlying meniscus tear or osteoarthritis. If you have a Baker’s cyst, you might not have had a specific traumatic event that caused it to develop. You might notice discomfort or swelling in the back of your knee. It’s possible, though, to have a small Baker’s cyst and not have symptoms. In fact, many people don’t even know they have one. Often there is no specific treatment necessary for the cyst. Sometimes the cyst will spontaneously rupture, which can cause some pain and leg swelling for a few days before resolving on its own. Occasionally a doctor can ty to aspirate, or draw fluid off, the cyst using ultrasound for guidance. Drawing fluid off the cyst has mixed results, as the cyst often either comes back or does not go away completely. Often a patient’s knee pain comes from the meniscus tear or arthritis that led to the cyst in the first place. If you have pain from a meniscus tear, surgery to treat the meniscus tear can usually help decompress the cyst. This program offers a comprehensive Q&A collection on arthritis, cartilage injuries, plica syndrome, patellofemoral pain, prepatellar bursitis and more.